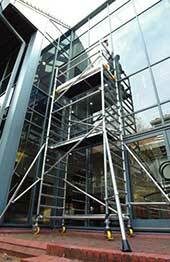 In addition to the standard scaffold types we provide, you can also hire towers that are for specific applications, such as the Stair Tower. 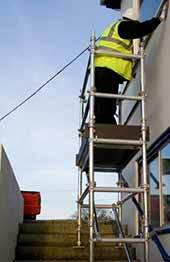 This Scaffold tower is ideal for those that are working in Zone 1 environments. Places when a non conductive Scaffold is essential. For example data centres, work on live electrical contracts. In addition work that is being carried out in food processing areas also often require this type of equipment. Ideal for areas where a large platform surface area is required. This setup is achived by using two scaffold towers joined by a bidgebeam section that doubles the surface area again. This system creates in effect a platform area size of 400% larger than a standard scaffold tower. This scaffold tower features twice as many rungs on the end frames. Basically this gives you the flexibility to place the platform exactly where you want it to be. It is sometimes case that you can’t block a doorway whilst work above is being carried out. Especially on busy shopfronts or work above fire doors. These special sections allow work to proceed. With the HSE and PASMA looking at safer ways to construct scaffold towers to lower the risks of falling from height, many manufacturers have designed advanced guard rail systems. Please enable the user to construct a handrail around the platform before stepping onto it. There are various systems and main contractors often specify the system they approve. We can supply to you most of the mainstream advance guard rail systems and you will find two most common systems on these pages. 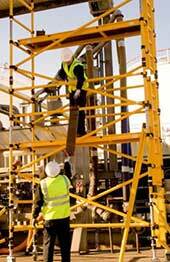 Cantilever scaffold towers are used in industry when the operator has to work above and immovable object. Also in domestic settings with maintenance is completed over a conservatory or a porch this cantilever section enables the worker to access the working area. This equipment is very specialist and very few hire companies stock these. Scaffold towers can also be used on stairwells but often need to be a lot narrower especially in domestic properties. 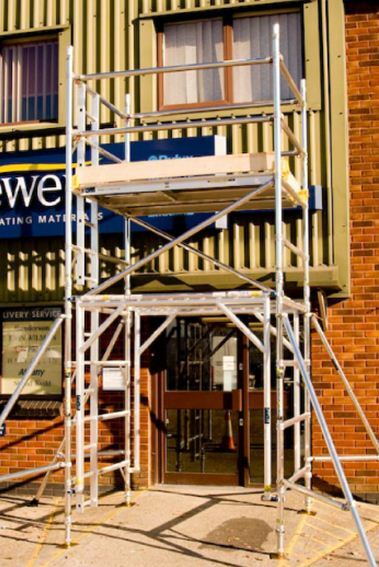 You can now hire a stairway scaffold tower that is less than 700mmwide and comes with the necessary frame sizes to take up the incline of the steps. This equipment is also often called astairmax.